Russian Defense Minister Sergei Shoigu has warned that the situation on the border between Russia and NATO countries has worsened, and may escalate. Speaking to Sputnik, security analyst Igor Nikolaychuk suggested that NATO's efforts on Russia's western frontiers are part of the alliance's effort to justify its existence. Speaking at a session of Russia's Defense Ministry Board on Friday, Shoigu said that the situation on the NATO-Russian frontier "shows a tendency toward escalation," with the alliance beefing up its strength in Poland and the Baltic states with new multinational battalions, in addition to a US Army brigade and army aviation based in Poland and Germany. The defense minister also pointed to expanding US efforts to build missile defense systems in Poland and Romania, and the continuing escalation of NATO drills near Russia's borders. "In the past three months alone there have been over 30 drills in Eastern Europe and the Baltic states," Shoigu said, adding that these drills often carry an "openly anti-Russian character." Russia has responded with its own drills, conducting over 20 exercises in the Western Military District to deter the alliance, the senior officer said. Speaking to Sputnik, independent international security analyst Igor Nikolaychuk said that the Russian defense minister's concerns are justified. "The aggressiveness of the NATO bloc on our borders is indeed growing," the analyst said. 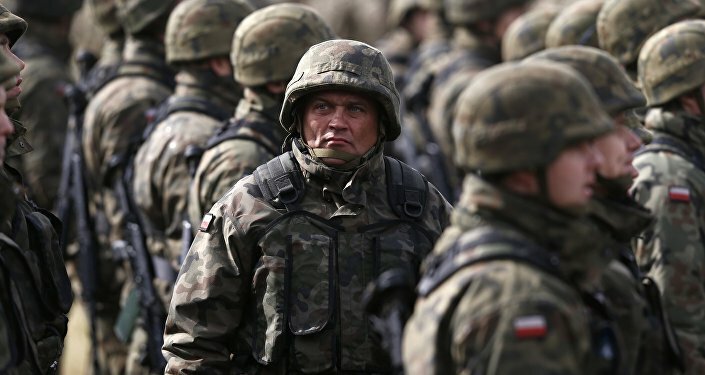 "For several years now, NATO has deliberately fueled tensions, mainly on the Baltic flank; the pressure on our western borders is simply unprecedented." "Of course, this does not mean that NATO has deployed some truly intimidating forces on our borders, and is prepared to make a march into Russia to capture Moscow…as Hitler planned," Nikolaychuk noted. "But compared to the situation five, or even four years ago, the situation has changed," he added. At the same time, the observer suggested that the rhetoric the alliance uses to justify its action is not subject to sort of criticism or logic. "Somewhere, something clicked, and it was declared, for no reason, that Russia is an 'aggressor', and that it is necessary to somehow stop it. They claim that Russia's goal in the near future will be the Baltic states, where some sort of absolutely fantastical Crimea-like scenario will be realized. But this is complete nonsense. NATO is just looking for some way to justify its existence, to show that it is needed," Nikolaychuk said. NATO has justified its continuing troop buildup, maneuvers and drills as a safeguard against potential 'Russian aggression'. Moscow, meanwhile, has repeatedly emphasized that it has no intention of attacking any NATO members, and risking starting World War III.